Just when you think Broadway has given up on classicly structured, in-depth emotional explorations in favor of pop culture revues designed to cultivate younger audiences, along comes a gem like Next to Normal, which hearkens back to Oscar Hammerstein's hard-hitting social commentaries that color Oklahoma!, Carousel, Show Boat, South Pacific, and The Sound of Music. 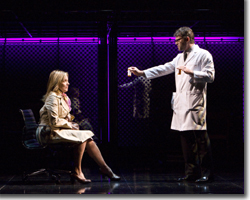 Unlike the well-crafted A Catered Affair, which failed to receive a nomination for musical in the year of Passing Strange, marginalizing what could have become a refreshing addition to the dinner theatre canon, Next to Normal garnered the Pulitzer Prize and three Tony Awards. The book is remarkable in its informed discussion of mental health issues that have become commonplace in our society, particularly those created by the medical and pharmaceutical industries in conjunction with the overall attack on society and civilization by the money cartel. 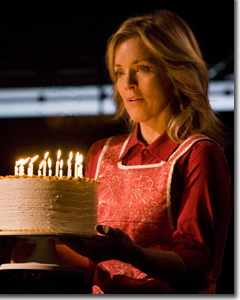 For the touring production, the Alice Ripley reprises her Tony Award-winning performance (Best Actress in a Musical) as Diana, a wife and mother who is haunted by the first of her two children, who was lost in infancy. Diana spends her days in relative isolation, which compounds her angst. She loses touch with reality, is loaded with prescription drugs by her doctors, and then is subjected to shock therapy. Yet, she breaks free of this standard AMA-approved approach to "normalcy as mindless consumerism," which sees her illness as incurable, i.e., profitable on a long-term basis. Ripley is simpley phenomenal in navigating the twists and turns of a mind that has lost its bearings. It's a rough ride for the family, as Diana's behavior triggers important lessons for each of them: her husband, Dan (Asa Somers), her daughter, Natalie (Emma Hunton), and her son that died, Gabe (Curt Hansen), whom she now imagines at the age he would be if he had lived. The build-up of details in Somers work comes to fruition when the rug is pulled from underneath Dan's compartmentalized world. Suddenly, his emotional arc is highly compressed in the wake of Diana's bold choices. Hunton's mastery of teenage metabolic highs and lows is refreshingly natural while embodying the full intensity of the manic mood swings and social drama that comes with the territory. Hansen masters the challenges of a symbolic character with a robust vocabulary of movement and, like the rest of the ensemble, excellent vocals. 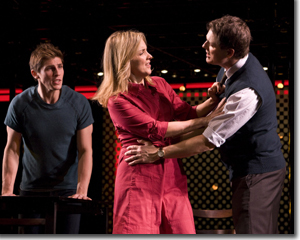 Jeremy Kushnier as the two doctors and Preston Sadler as Henry, Natalie's boyfriend, round out the stellar performances. 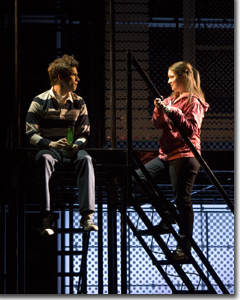 Denver Center Attractions presentation of Next to Normal closed in Denver on January 16th.